If you are responsible for premises such as a shop or small industrial unit, following this scheme helps you to carry out your legal duty to manage asbestos. Finding out and recording where asbestos might be. Deciding what is most important. Deciding what action to take and how to plan any work. Before you begin, print this checklist. This is important as the process takes some time to complete. It will help you to note down where you are up to in your assessment. Please bookmark this page so you can return to it at a later date. Work through the steps in order. You won't be able to do it all at once. You will need to come back to this site as you work through the steps. Some parts take longer than others. You don't need to be a health and safety expert. 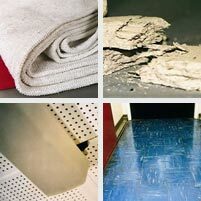 Asbestos is only dangerous when disturbed - avoid unnecessary disturbance. If unsure, presume that material contains asbestos. The duty to manage does not require asbestos removal. If you find anything wrong while following the scheme, get help.